Two starkly different books today, but with common themes. Both would fall under the ‘animal’ genre label, although one is set very much in contemporary times, and one is historical. Both involve caring for animals, and impart knowledge about them, but both are excellent stories in their own right (age 9+ years). The first of a heart-warming new series about Zoe, whose family runs an animal park. The first book tells of the family’s arrival at Tanglewood as they prepare to take over the zoo and re-open it for the public. With teething problems galore, and new relationships to forge, there is plenty going on throughout the book. What’s wonderful is the amount of animal knowledge (such as feeding, habitats, endangered species etc) deposited throughout the book, either as part of the story or as dialogue between the characters, so that for the young reader they can absorb the animal information at the same time as reading a cracking story. And it’s not just zoo animals – Tamsyn’s characters rove freely around the zoo so that as well as hearing about penguins and lemurs, there is also information on guinea pigs and the sort of animals that readers might have at home. It’s not subtle, but the story and characters are written masterfully by experienced author Tamsyn Murray so that the story dominates the information. The characters show that they care for each other as much as the animals – using their own animal instincts to sense emotions and feelings in each other – showing great sensitivity. 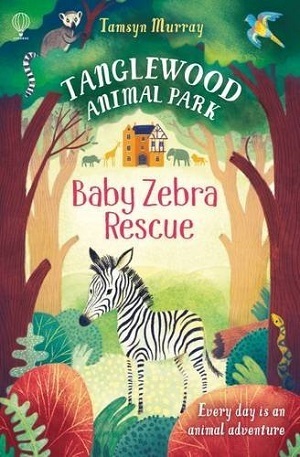 The main action revolves around the birth of a new baby zebra, but is also dominated by the relationship between Zoe and the boy who already lives at Tanglewood – Oliver, the son of the vet. This is well explored, as it is frosty in the beginning, Murray showing the hurtful way in which words and deeds can be twisted to wound someone, but also in the way in which friendship can be sought when needed. Zoe’s parents are naturally preoccupied with the opening and their lack of sleep, Zoe’s baby brother has his own fears, and Zoe’s peer Oliver has dark emotions of his own that are revealed throughout the story. In fact Murray carefully drops mysteries and clues, so there are lots of little subplots to keep the reader engaged. It’s realistic, interesting and a good story. A great new series to explore. You can buy it here. (For my readers in Hertfordshire, Tamsyn Murray will be at Paradise Wildlife Park this weekend talking about her writing and celebrating this series (first weekend in July). Another gentle story, but this time involving much darker elements as the backdrop to this story is the breakout of the Second World War. Twelve-year-olds Rosy and Tilly find out that they will be evacuated to the countryside once war breaks out, but unfortunately their beloved pets will have to be put down first. This is based on the true story of the days leading up to the outbreak of war when citizens were advised that pets should be destroyed as they wouldn’t be able to be cared for during the ensuing rationing and bombing. The author has cleverly built a stimulating story from her discovery of letters to the press after the announcement of war, which portrayed people’s regret about destroying their pets. 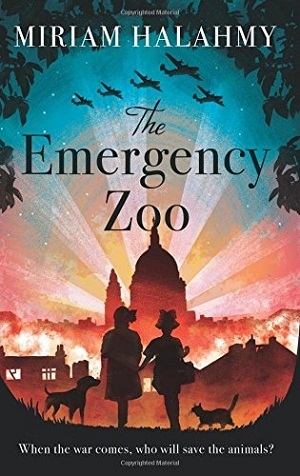 This little piece of social history weaves into the story of Tilly and Rosy as they build an ‘emergency zoo’ in an abandoned building not far from their homes, harbouring an assortment of pets from an equally interesting eclectic mix of children. The story is the simple ups and downs of how Rosy and Tilly feed and protect their pets, and eventually whether they find a solution to where the pets will go when Rosy and Tilly are evacuated. However, Halahmy’s cleverness is her historical acuity. Set in a timeline of the week preceding the announcement of war, she draws in children who have arrived from Germany via the kindertransport, the existing social divides in England, parental memories and consequences of the First World War, and the tension leading up to the Second. Most interesting though is the difference between the lives of the children in the 1930s from their contemporary readers: the conversational etiquette when addressing parents and grownups, the freedom of the children to roam, and yet the respect and help that was demanded from them in return. This simple story has considerable depth. It is great in today’s world to read a book that encompasses animal welfare, the courage and determination shown by two small girls, and the resourcefulness at times of difficulty. There is an uplifting ending despite it being only the beginning of the girls’ stories – the start of the war and the girls’ evacuation – which makes this a tremendous book for a gentle exploration of one small facet of the Second World War. You can buy it here.